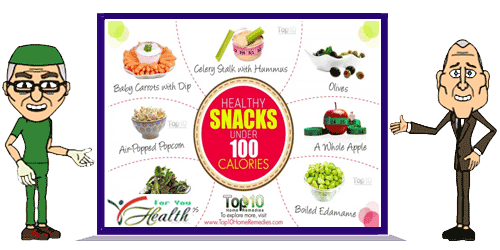 There are many healthy snacks to choose from that are less than 100 calories and won’t give you extra fats and sugar that are unfavorable to your waistline. Here are 5 healthy snacks that are under 100 calories. Though the best place to enjoy popcorn is in the theater, you can eat it anytime you feel hungry to keep you feeling full without adding lots of extra calories. However, to enjoy it as a healthy snack, always opt for air-popped popcorn, not the commercially available buttered popcorn. One cup of plain, air-popped popcorn contains approximately 30 calories. Being a good source of fiber without excess fats and other additives, air-popped popcorn is a must if you are trying to lose weight. Air-popped popcorn contains small amounts of vitamins and minerals, such as magnesium, potassium, vitamin A, phosphorus, zinc, manganese, iron and copper. This healthy snack can help you lose or maintain your weight, regulate digestion and lower cholesterol. Replace those oil-fried potato chips with nutritious kale chips for a healthy snack. One cup of baked kale chips contains just 50 calories and many say they taste better than potato chips. Plus, they have no cholesterol or sugar and are very low in sodium. Kale is rich in vitamins K, A, C and B6 as well as fiber, manganese, copper, calcium, and potassium. Fiber-rich kale helps lower cholesterol and manage diabetes, provides anticancer benefits and is good for your brain, immune system and bone health. It is easy to make baked kale chips at home. Toss chopped kale in a small amount of olive oil and bake them in the oven until they are crispy. One large celery stalk contains just 10 calories and is naturally low in carbohydrates, fat and cholesterol. For less than 100 calories, you can eat 3 or 4 celery stalks with some homemade hummus (hummus is high in calories– 1 tablespoon contains about 25 calories, so take only 1 or 2 tablespoons). Celery is rich in fiber and hummus contains protein, and together they make a satisfying snack. As celery mostly comprises water (95 percent), it also helps keep the body hydrated, which aids weight loss and keeps your skin and hair healthy. Plus, celery contains other nutrients including vitamins A, C, K and some B vitamins as well as calcium, magnesium, phosphorus, folate and potassium. Celery also helps improve digestion, lower high blood pressure, reduce bad cholesterol, and improve vision. When taken in moderation, hummus is also good for your health and keeps you fuller for longer as it is rich in protein and fiber. Raw baby carrots make a wonderful low-calorie snack. These carrots are sweeter and juicier than full-size carrots. Even a large baby carrot has just calories and a medium-size one contains only 4 calories. So, you can easily eat about 10 baby carrots in a day. You can even dip them in your favorite hummus or salsa for added taste. Baby carrots are not just low in calories but also high in nutrients, such as vitamins A, B6 and C as well as fiber, folate, calcium, iron, magnesium and phosphorus. Eating baby carrots will help keep your eyes healthy, prevent upper respiratory infections, aid digestion, boost immunity, lower cholesterol level, reduce diabetes risk and protect against colon cancer. You might be familiar with the numerous health benefits of olive oil. But you can enjoy olives as a low-calorie snack between meals, too. Twenty olives roughly equal just 68 calories and surely satisfy a salty craving. Olives are a good source of monounsaturated fats and contain important nutrients like copper, iron, fiber and vitamin E. Being full of nutritional value, olives help treat arthritis, osteoporosis, constipation, inflammation and asthma. Olives also reduce the risk of heart disease, lower blood pressure, protect against cancer and even delay the effects of aging.